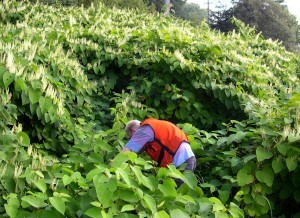 Japanese knotweed has been taking over streambanks across Potter County. Local groups are fighting back. Potter County’s Water Quality Work Group held its first meeting of the new year this week with a crowded agenda. One priority is the ongoing attack against invasive species which continue to flourish along many of the county’s cherished waterways, choking out native vegetation and destroying habitat. Upper Allegheny Watershed Assn. volunteers are gearing up for round two of an aggressive battle plan against Japanese knotweed along Mill Creek, an Allegheny tributary. UAWA spokesman Frank Weeks said chemical treatment with herbicides and cutting are planned, as part of a Coldwater Heritage Partnership Grant, which is a collaborative of Pa. Fish & Boat Commission, the Pa. Dept. of Conservation and Natural Resources, and Trout Unlimited. 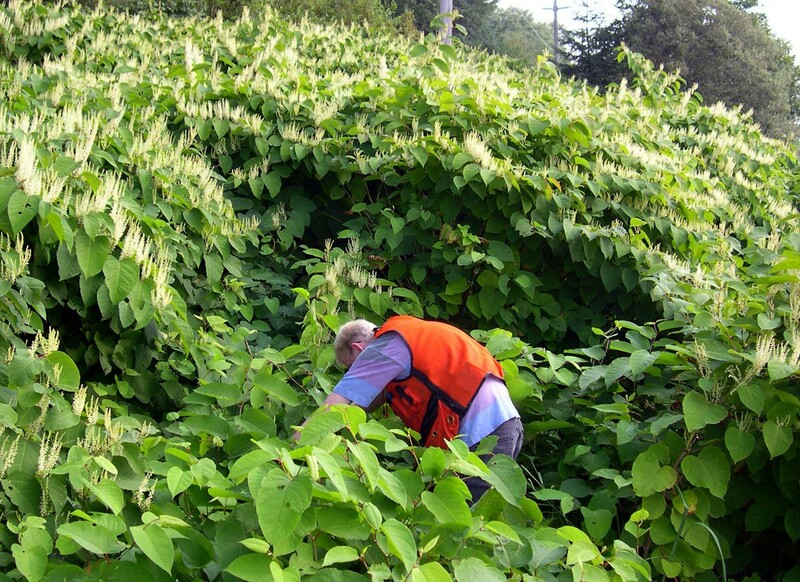 Meanwhile, the Genesee Headwaters Watershed Association will be applying herbicides to kill Japanese knotweed patches that have been rapidly growing near the Genesee Community Park and other sections in that district. GHWA spokesman Darrel Davis reported that Nikki Ryan, invasive plant project coordinator from the Bucktail Watershed Assn. in Cameron County, has been assisting the Genesee group. Another invader is also bearing in on Potter County. Jared Dickerson, watershed technician with the Potter County Conservation District, informed work group members that the hemlock woolly adelgid is working its way upstream in the Pine Creek Valley and will eventually reach the upper branches in Potter County. Hemlock trees provide important environmental benefits — from shading of waterways to wildlife habitat — but they are no match for the insect once it gains a foothold, Dickerson said. He added that strategic plantings of hemlock seedlings are starting in some sections of the Pine Creek Valley to establish a new generation for future decades. Jason Childs, manager of the Potter County Conservation District, summarized more than a half-dozen ongoing projects geared toward protecting water quality and enhancing public education. Among them are improvements being made to Ludington Run, a Genesee River tributary, to improve fish habitat; assistance to farms, including streamside fencing, mostly in the Cowanesque River headwaters where Chesapeake Bay protection regulations are being implemented; numerous streambank stabilization projects across the county; culvert replacement to improve fish migration in Gravel Lick Run; and others. Triple Divide Watershed Coalition chair Charlie Tuttle reported that a contractor will soon be chosen to install 24/7 water quality monitors on many of the 16 springs, wells and surface water sources feeding 10 public water systems in Potter County. Commissioner Doug Morley announced that county officials are beginning compilation of a new comprehensive plan, as required by Pa. Act 247, and will be seeking input from the Water Quality Work Group. Potter County Planning Director Will Hunt reported on the plan for a detailed feasibility study to determine the future of the dam on the West Branch of Pine Creek in Galeton Borough and related issues. Members heard that multiple organizations are working on plans to build large woody debris structures on Kettle Creek to improve trout habitat. Childs briefed the group on proposals before the state legislature to impose a per-gallon fee on withdrawals from public water sources to establish a dedicated funding source for water protection activities in Pennsylvania. Members also expressed their appreciation to Jim Clark of McKean County for his involvement with the work group and other organizations. Clark is retiring this month after many years of service as an educator and water specialist with Penn State Extension. Attendees were Frank Weeks, Will Hunt, Earl Brown, Jason Childs, Charlie Tuttle, Jared Dickerson, Darrell Davis, Pete Ryan, John McLaughlin and Commissioners Doug Morley and Paul Heimel. A Potter County native who now heads the Pa. Board of Probation and Parole is impressed with criminal justice reforms that have been put into place back home. “Potter County is a great example of what can be accomplished when you take the initiative,” according to Leo Dunn, appointed executive director of the board last March. He’s referring to the county’s “specialty courts” for criminal defendants with addiction to alcohol or other drugs, as well as a new pre-trial diversion program designed to reduce the number of criminal defendants who end up in jail. “There are a lot of new treatment resources available that counties such as Potter have elected to take advantage of, and with a great degree of success,” Dunn said. “Specialty courts, job training, housing options and substance abuse counseling are some of the tools that work . . . They’re having a very positive impact on reducing recidivism.” Number of inmates in the state prison system has fallen from 51,757 in 2012 to 49,900 today. Similar reductions have taken hold in a number of county jails. Primary goal of the specialty courts and diversion program is to address individuals’ needs with a customized treatment plan and intensive supervision by the Potter County Probation Department. 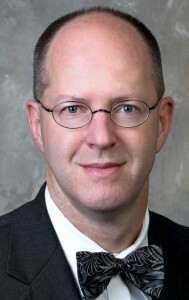 Senior Judge John Leete presides over both of the specialty courts. Overarching goal of the initiatives is to improve public safety by reducing the number of repeat offenders. Dunn said one consequence of lowering the recidivism rate has been a marked increase in the number of people being monitored on probation and parole, which requires additional staff and caseloads at both the statewide and county levels. Since 2012, the ranks of state parolees grew by almost 6,500, to nearly 32,000. Dunn said the state has responded by hiring more staff, bringing the average parole agent caseload from 80 clients to 50. At the same time, Potter County has also added to its staff in the Probation Department. Rep. Martin Causer (second from left) discusses state government issues with (from left) Commissioners Doug Morley, Paul Heimel and Susan Kefover. State Representative Martin Causer spent most of Thursday morning discussing a wide variety of timely issues with the Potter County Board of Commissioners. He pledged his support for continuation of the shale gas drilling “impact fee,” which has provided townships, boroughs and the county government with significant revenue that would otherwise have to be generated by the real estate tax. Rep. Causer also said he is eager to be involved in any efforts being pursued locally to prevent two major mergers in the telecommunications industry from causing job losses at two Coudersport employers. Additionally, he reiterated his support for the Rural Regional College of Northern Pennsylvania. Much of the discussion focused on Governor Tom Wolf’s 2017-18 fiscal year budget proposal and the significant issues lawmakers will have to address to achieve upwards of $3 billion in spending cuts or revenue generation the governor has called for to balance the $32.3 billion plan. The commissioners urged Rep. Causer to push for adequate state funding for the myriad of human services that county governments are mandated to provide. An indiscriminate 10-percent cut in state funds several years ago has continued to burden county taxpayers and all signs point to an increasing demand for services in the coming years.